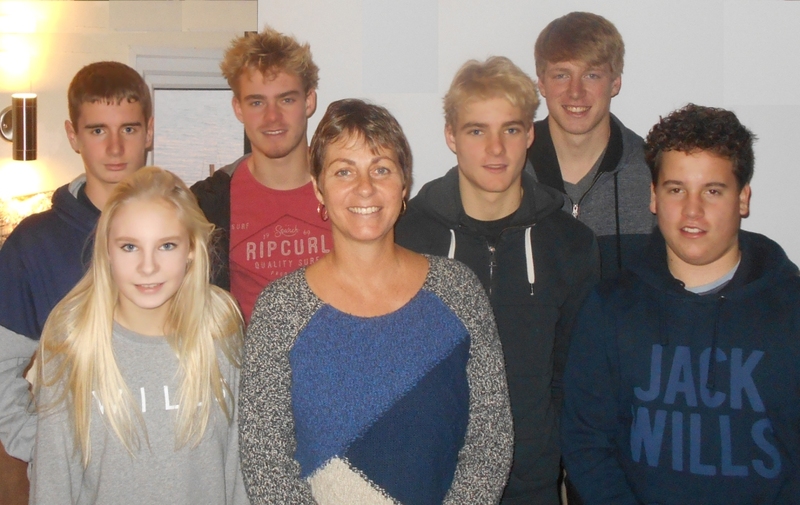 The Gunfleet Sailing Club’s younger members, those under the age of eighteen of which there are 69, held their Annual General Meeting in the Clubhouse on Sunday 11 December. Retiring Cadet Commodore Daisy Swinbourne, having reached the age of 18, welcomed those attending and looked back over a full year of social and sailing activities, particularly focusing on the sail training early in the season, and the wide range of opportunities to get on the water. 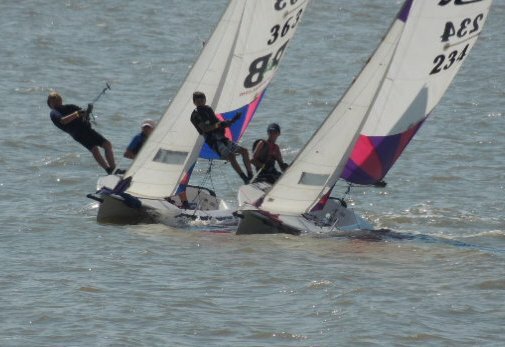 The Gunfleet Sailing Club was kept busy on Sunday 25 September when it held the Hobie 405 Splash, with three races spread over the day. 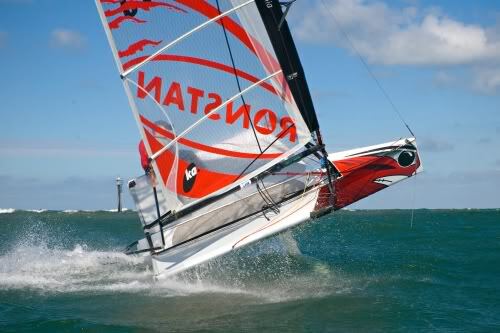 Seven 405’s took part, the craft being specifically designed as youth development boats with a trapeze for the crew and an impressive asymmetric spinnaker. Large waves and a force 5 to 6 west/south-westerly wind meant it was going to be both a lively and very wet sail. 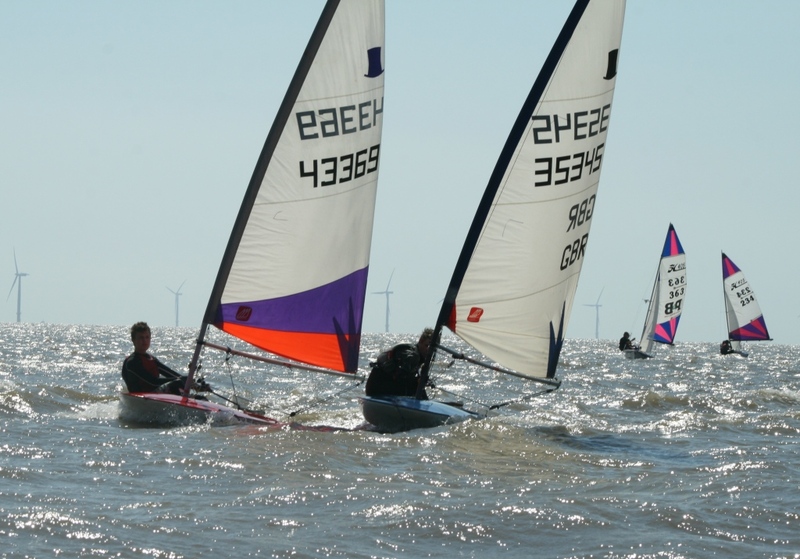 Gunfleet Sailing Club held its Regatta Weekend, kindly sponsored by Discount Windows and Conservatories of Clacton, with some great sailing spread over two days of the August Bank-holiday. 2016 Gunfleet Cadet Week - It Was Brill!! MONDAY...Sunshine and a stiff west/south-westerly breeze greets the Club’s Cadets and Otters as they arrive for the start of the 2016 Gunfleet Cadet Week, sponsored by Dong Energy. Boats rigged, everyone in their wet gear, and it’s time for the briefing in the Clubhouse, whilst outside the wind continues to freshen. The four Team Captains are Cadet Rear-Commodore Tom (405), Cadet Social Secretary Beth (405), Cadet Sailing Secretary Ross (405) and Cadet Vice-Commodore Harry (Laser). 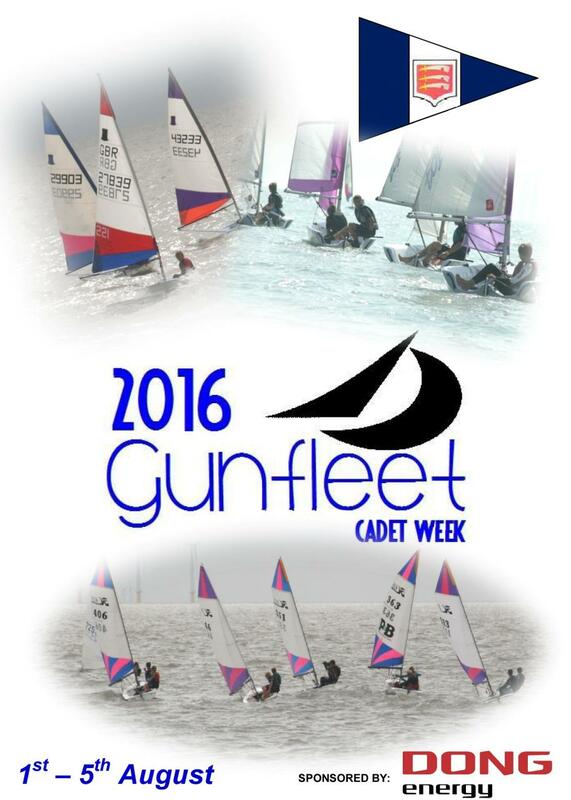 It's getting closer and closer...the 2016 Gunfleet Cadet Week, sponsored by Dong Energy, which promises to be an awesome event. We're counting-down the days to some brill fun. Don't be one to miss out; there are loads of us going....with racing, cruising, games on the water, games off the water, a really great lunch every day....it just goes on. And then there is the Cadet Week Party on Saturday 6 August - the cool place to be. 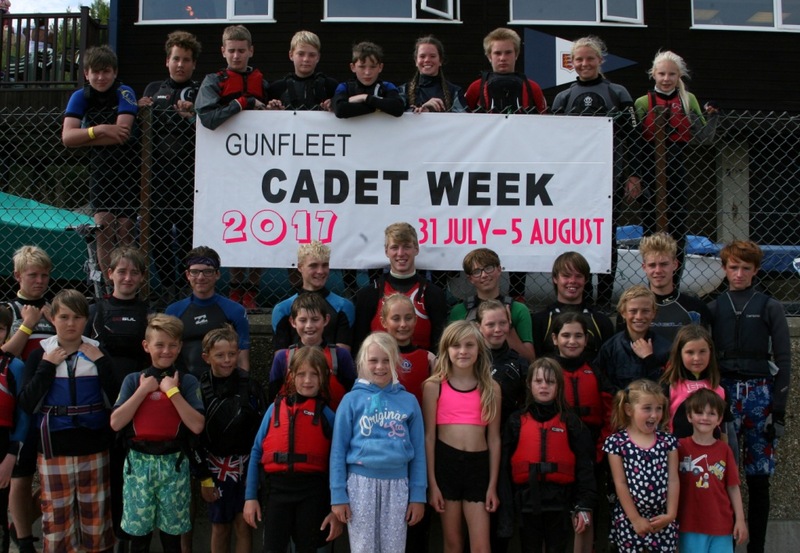 Hi, it’s almost time for the 2016 Cadet Week down the Gunfleet, and if you’re aged between 7 and 17 you won’t want to miss this as it’s going to be awesome! The Week kicks-off on Monday 1 August and ends on Friday 5 August; then, on Saturday evening, 6 August, there will be the Cadet Week Party, with a scrumptious Hog Roast. Each day of the week goes from 10:30 a.m. until 4:30 p.m. and there will be absolutely tonnes of fun things to do on, in, and off the water – racing... cruising...games...treasure-hunt...picnic...and loads more. 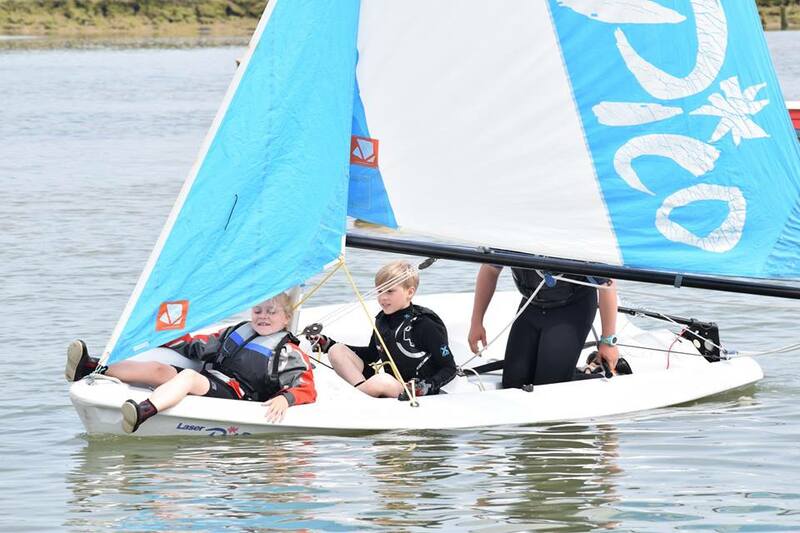 SOS was a real blast last Saturday 18 June when 24 of the Club’s Cadets and Otters took to the water for some sail training. Eight, under the guidance of experienced members Peter Downer and Dave Fowell, were given basic sail training – the art of sailing a dinghy on the high seas; the remainder getting in some sharpening of their sailing skills to help make them real top-notch helms and crews, lead by seasoned sailors Ken Potts and Andy Dunnett. Hey...didn’t we have an awesome time on Saturday 11 June when we were the guests of Walton and Frinton Yacht Club? 20 of us went along and got out on a fleet of Pico’s, Tera’s and a Topaz. The light winds were in just the right direction which meant that when we launched we just ran down Foundry Reach and turned port into the Twizzle. Sailing amongst the moored craft, we soon passed Titchmarsh Marina, and went on over the Wade. The tide was still flooding and one or two of us just bumped the mud with our daggerboards, but we got across. The second SOS brings us the first in the series of Class Racing....so whether you have a Topper, Topaz, or 405, it's time to get on the water and really make your boat sing! It all starts at 3:00 p.m., but get down to the Club at 2:30 p.m. to get changed and your boat all ready. And, as always, there will be burgers and hot-dogs on sale after the fun on the water. Make it a date - Saturday 28 May, 2:30 p.m., down the Gunfleet......COOL! YES it starts this Saturday 21 May down the Club – I’m talking SOS – Sailing On Saturday for all us Cadets and Otters. It’ll be great to get out on the water and have some real fun, catch-up with our mates, and tuck into a burger or hot-dog when it’s all over. For us old hands it’s all about getting a brilliant start and showing everyone, including those adult sailors that, actually, we can lead from the very beginning. Last Saturday evening, 5 March, there was a very good turn-out for the Club's Cadet Night with a whole crowd sitting down at the start for a fish and chips (or jumbo sausages and chips) meal. After the meal was over it was a really relaxed atmosphere as everyone settled down to an evening of entertainment. This was very light hearted, taking a break from the previous two events, which were part of the Club's high-tech sail training course. 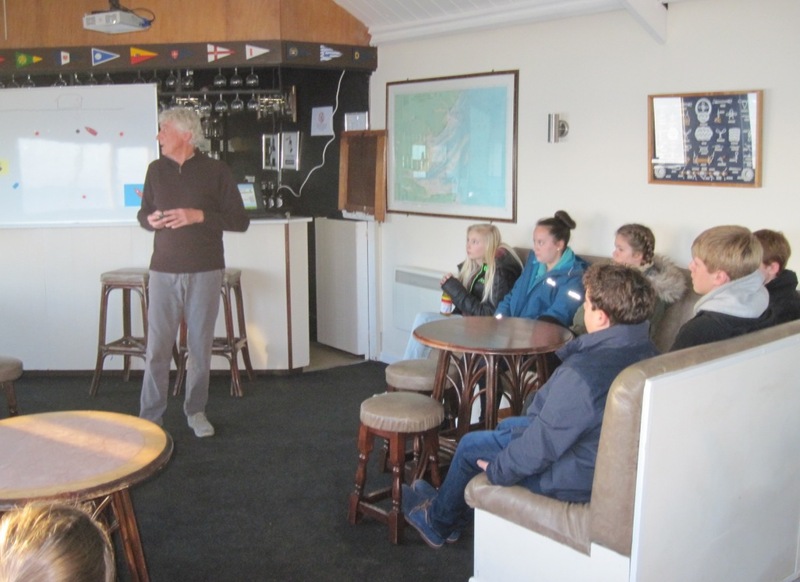 Gunfleet's Cadets and Otters turned up in force last Saturday 20 February when the Cadet Officer, Andy, gave the second part of his sail training course, this time all about maximising boat speed. Using a variety of teaching aids - PowerPoint, whiteboard, models, and interactive diagrams, Andy brought the whole thing to life, explaining exactly how you can get that extra speed on the water and how in turn you can win races. Hey dudes - it's the second SOS Sail Training this Saturday with our main man Andy giving us the lo-down on Boat Speeeeeeed - how to get ahead of our competitors, stay in front, and blast through the finish line....awesome..jaw-some. Don't miss out this Saturday 20 February at 3:00 p.m., oh yea, and catch-up with our mates too.